* I received complimentary admission as a US Family Guide Blogger. We packed up the van last night and headed down to Des Moines for the first night of the LEGO Creativity Tour. We had a blast and a lot of family fun! 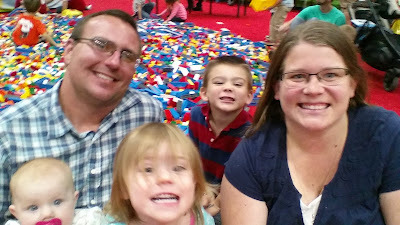 We had to take a family selfie in the Big LEGO Brick Pile! Preview the Map: Once you arrive at Hy-Vee Hall for the LEGO Creativity Tour you'll receive a map of the show floor. But you can preview it before you go by checking out their website's Plan Your Day tab. We looked at the map before we arrived at the show and it was great to know what sparked interest of our kids before we got there. Because once you get there you'll be in amazement of everything and won't be sure where to start. But if you remember some of the locations that your kids were excited about, it'll help you get a good start. I will also let you know that the three hours per session is just about right. We didn't have time to do everything, but we had time to do everything we wanted to and more. None of the kids got bored or tired, it was just the right amount of time. 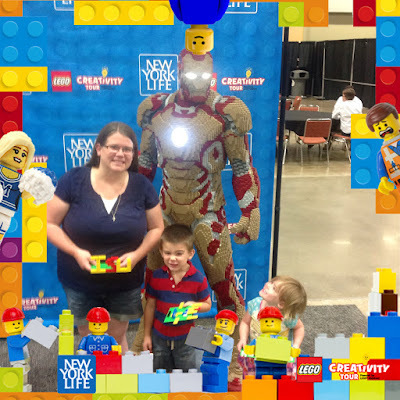 Know where the Freebies are: There are a lot of activities and races you can do at the LEGO Creativity Tour and the best part is that they're all included with the price of your ticket! Make sure to go to the Community Build. After completing a fun build project, you'll receive a free mini Lego City kit and have a photo opportunity. And by the way, wherever there is a photo opportunity, the staff there will take your photo and give you a copy of it afterwards. Last night they were working through some glitches with their printers, so hopefully there won't be any for the the rest of the weekend. Watch The LEGO Movie before you go: We have 100 miles to travel to Des Moines, so it was just about the perfect drive to fit in The LEGO Movie on our trip to the LEGO Creativity Tour. This is just a fun way to get in the mood for the show, and as soon as you enter the event you are greeted by characters from the movie such as Emmet, Lucy and Lord Business. So are you excited and ready for your visit this weekend! There are still tickets available for some sessions both today and tomorrow so you aren't too late to get in on the fun. What are you looking forward to? Remember to Comment for a Cause! Looks like everyone had an awesome time. I sat and watched the movie and let the kids run amuck.... Success! Glad you had fun Pat! It was a great experience! I'm glad we were given the opportunity. What a fun time you guys had. I love this idea and think that it must have been an amazing time. Good for you for making the time to make some memories here. It was great that all five of us got to go! We all had a lot of fun!